Earlier this month, I posted how Citibank was denying many customers the signup bonus on Citigold accounts opened earlier this year claiming they aren’t specifically “targeted”. The bonuses at stake weren’t insignificant – it was either 50,000 American Airlines miles or 50,000 ThankYou points depending on the applicable Citibank credit card that customer held. Since that post, some reports have trickled in that Citibank is awarding some customers the bonus but certainly not everyone who was initially told they were eligible but now is not. Here is what I did to get Citibank to agree to post my wife’s signup bonus. 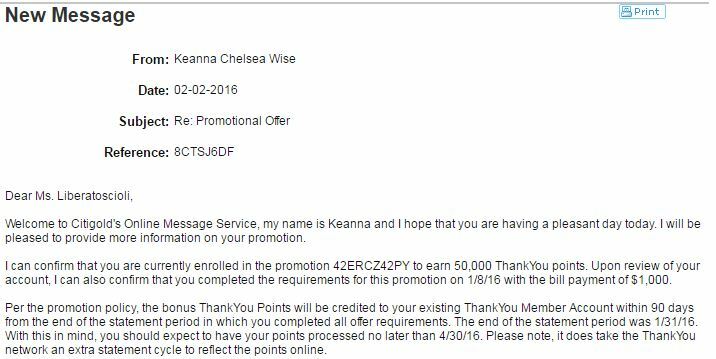 My wife applied for a Citigold account with the 50,000 ThankYou points offer on it in December 2015 and even after multiple reps confirmed she was eligible for the bonus after meeting the requirements, Citibank never posted the bonus to her account (more details in this post). 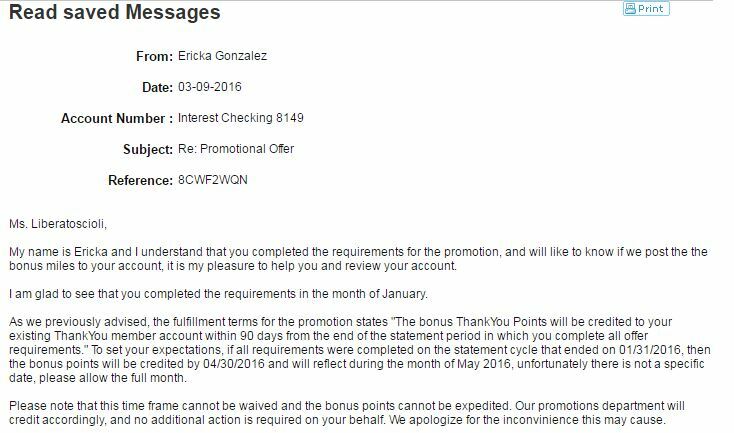 When she followed up earlier this month when the points didn’t post by 4/30 as previously promised by Citibank, she was told only now she was not eligible for the bonus because she wasn’t specifically targeted. While technically that was a term of the offer, since multiple reps confirmed the offer and we made financial decisions with Citibank assuming the bonus would be paid (such as keeping the account open and paying monthly $30 service fees), we both felt it was only right Citibank award the bonus so we decided to fight their decision. I started protesting their decision by sending a simple secured message stating that I thought it was a mistake as other reps had previously confirmed the bonus and I asked them to look into the matter. Unsurprisingly, Citibank didn’t budge and issued an official investigation letter that confirmed my wife was indeed not eligible for the bonus. When that failed, I resorted to calling Citigold customer service (with my wife giving the agent permission to speak to me) though I was skeptical this was going to work. Even if I was able to get an agent to agree to post the bonus, I would want something in writing officially confirming that but I didn’t reach that point as speaking to an agent and then a supervisor provided to be utterly fruitless. They kept repeating the results of the “investigation” so I cut my losses and moved on to a more drastic measure. I ended up filing a complaint with the Consumer Financial Protection Bureau. To be honest, I was tired of all the crap from Citibank and went straight to the measure I thought had the best chance of success. It didn’t take long to fill out the complaint and they said I could expect a response within 15 days. The downside to this approach, as several of you mentioned on Twitter, was running the risk of a complete shutdown from Citibank and my wife losing the ability to apply for additional Citibank credit cards and banking products. Since my wife has no red flags on any of her Citibank accounts (such as constant churning, heavy manufactured spending, etc.) and the bonus being worth over $500, I decided the risk was worth it to me – others will disagree but it really wasn’t much of a decision to me. While waiting for a response, I decided to try and convince Citibank one more time to award the signup bonus and sent them what I thought was a pretty firm message on the topic. Maybe I shouldn’t have done this since I already filed a CFPB complaint but I figured what the heck – I’d rather be persistent and hound Citibank until I got my desired outcome. Notice in my response to them below, I said I might file a complaint with CFPB. I forgot to include that by might, I actually already did but I figured it is probably different people/departments responding to this message vs. CFPB complaints so I was using the threat of a CFPB complaint to convince this agent looking at the message to award the signup bonus. I forgot to check my wife’s account for a few days but when I logged in, I saw another official “investigation” letter but this time with a much better outcome – now my wife was eligible for the bonus. I’m not sure what changed in their “investigation” but they are promising to post the 50,000 points within 30 days. Considering I have a very formal document detailing the outcome of this ordeal, I do believe Citibank will actually post the points this time. From my experience and what I’ve read on other success stories, the key to winning this fight with Citibank is to be persistent as hell and/or file a claim with the CFPB. For my wife’s account, I chose to not only file an official CFPB complaint but to continuously hound them via secure message. I tried to make it very clear I would not stop fighting for this bonus while trying to remain civil yet firm throughout the ordeal – yelling/screaming/swearing at representatives won’t get you anywhere. While I don’t know if Citibank just got fed up with me or my CFPB complaint actually worked, Citibank suddenly decided my wife was eligible for the bonus again and I have a new, confirmed letter that as a result of their “investigation” the points will post in 30 days. I’ve downgraded my wife’s account to a Basic account to avoid any more service fees and I’m looking forward towards spending the hard earned 50,000 ThankYou points. Earlier this year (and for parts of last year), Citibank had generously offered either 50,000 Thank You Points or 50,000 American Airlines miles for opening a Citigold checking account. While technically the terms stated that the offer was for “targeted bank cardmembers who receive this communication”, in practice anyone with a Citi ThankYou card or American Airlines card was eligible for the offer – and Citibank would confirm this in writing shortly after opening the account. For many people who applied last year there were no issues getting the points/miles posted. In short, back when you used to be able to fund these accounts with a credit card, this was a pretty amazing offer for opening a bank account. However, Doctor of Credit posted some disturbing information yesterday that Citibank is now refusing to pay out the 50,000 ThankYou Points or 50,000 American Airlines miles that were offered as the signup bonuses on Citibank Citigold accounts for customers who did not directly receive the communication. While I safely earned and obtained my points last year, I didn’t open my wife’s account until December and to date, she has not received the 50,000 ThankYou points despite multiple confirmations in writing that she is eligible and promises they would post by 4/30/16. I understand Citibank’s viewpoint that only targeted members who received a mailer should have been eligible but my wife, along with many others, got written confirmation they were eligible for this offer and thus, should be compensated accordingly in my opinion. My wife’s actions to keep the account open and use it were predicated on receiving the points – if I was told I was not eligible, than my actions would have been different and I would have most likely closed the account (and saved $30/month in service fees). It’s fair to say I’m just a bit upset here and I plan to fight for her 50,000 points which are easily worth $500+. I’ve tried the secure chat/secure message/phone call route and I’ve gotten no where – all the reps keep asking for the physical mailer showing proof she was targeted. Even if I did have a physical mailer, I signed up for this account back in January and I’ve had two different Citibank agents confirm it in writing – why would I even keep said mailer? That by itself seems like an unreasonable request to me – even if I was truly targeted and had a mailer at some point. So my plan to fight this is to file a complaint with the CFPB, better known as the Consumer Financial Protection Bureau. These complaints are usually taken pretty seriously but of course there is no guaranteed result. If this was over $20 or even $50, I wouldn’t bother. But a bonus worth $500 is significant to us and I know my wife wouldn’t have chosen to pay these service fees if she wasn’t getting the points. I plan to attached PDFs of the written confirmation from Citibank (all of them) as well proof I met the terms of the conditions. At the very least, I want the monthly service fees refunded (which Citibank has also refused at this point) but I think my wife has a strong case here and I am hopeful the CFPB will agree & force Citibank to award her the 50,000 ThankYou points. Oh Citibank, we used to be great friends with your credit card funding for bank accounts and generous offers on your Citigold product but I think it’s time to cutback on our relationship. Once I get my bonus points (and trust me, I will fight like hell until I do) you won’t have to worry about me having any of your checking or savings accounts. I’ll consider keeping your Prestige card but that’s about it. Your infamous $hittyBank service you are famously known for has struck again but I won’t put up with it. It’s time we Fight For Our Right to Party Citigold Signup Bonuses. Earlier this year, I detailed my experience opening a Citigold checking account to earn American Airlines miles and how I was able to fund it successfully with a credit card. Once the miles had posted for opening the Citigold account, I downgraded the account to a Basic Checking account which I have kept open with the minimum amount ($1,500) in it to avoid any monthly service fees. I realized I never opened a savings account with Citibank when I opened that checking account so last week I opened a Savings Plus account for the sole reason to fund it with a credit card to earn points. Spoiler alert – I was successful but here is a recap of the various steps I took and important details you need to know. While there are various ways to apply for this account, I chose to apply online as this was the quickest and most convenient method for me. On the Citibank Savings Plus account information page, it clearly lists the ability to use a credit card to fund the account which alleviates any concern about using a credit card. After clicking the Apply Online button, you will see a screen asking you to choose which kind of Savings Plus account package you want (Citigold, Basic etc..). Since I had a Basic checking account now, I obviously just chose the Basic Banking Package (even though it’s called a package, I was only opening a Savings account). After filling out all the required information, you will eventually get to a point where you will be asked how you want to fund your account. The following is important as only the initial funding can be done via credit card and you don’t want to mess this up! Decline any offer to fund the account with a Citibank checking account or any other account you may have with another bank. Note: You actually can’t fund a Citibank account with a credit card online. Unlike when I opened my checking account, I was not given option to print a form to fax in my credit card information to fund the account so I would have to call in to fund it. It is advisable to wait a day to call in to fund the account as reps can’t initially process funding on the account. In the meantime, decide which credit card to use and set the cash advance limit to zero. Doctor of Credit maintains an excellent list of which cards will post this as a purchase vs. a cash advance. It might also be helpful to call your bank and inform them of a large purchase but I did not do this. I would choose either a Citibank or Barclays credit card as I haven’t read many reports of those cards posting as cash advances. I personally used my Citi Prestige. Citibank won’t accept American Express so no Amex cards will work. DO NOT USE a Chase card under any circumstance as this will almost always post as a cash advance. Once you’ve waited a day call New Accounts at 1-800-745-1534. Protip: They are only open Monday to Friday from 9am EST to 6pm EST. Tell the rep you opened a Savings Account yesterday and you would like to initially fund it with a credit card. My rep noted the funding would be processed as a purchase but did warn me some banks will still treat this as a cash advance and I would be responsible for any fees. After providing my card information, my rep stated the account would be funded in a few days and in the event something went wrong, I would receive an email notifying me of the issue. Sure enough, I checked two days later and I saw a $14,500 charge on my Citi Prestige AND $14,500 in my new Savings Account. Success! I didn’t list it above but the only fees associated with this Savings Account is a $4.50 monthly charge if your average daily balance is less than $500. I didn’t see anything about early termination fees if you wanted to close the account right away but I personally would not do that and jeopardize your relationship with Citibank. My plan is to keep $500 in the account for a few months and close it sometime next year. Even though I didn’t receive any signup bonus for opening this account (unlike the current Citigold offers for 50,000 ThankYou Points or 50,000 American Airlines Miles), I still think this is a worthwhile endeavor especially if you already have a checking account with Citibank from a previous offer. Opening a savings account allows you another easy opportunity to fund a bank account with a credit card for a large amount – your credit line is the only constraint! For maybe 20 minutes or so of work, I earned 14,500 Citi Thank You Points. If I redeem those points at a rate of 1.6 cents per point for AA flights, that’s worth $232 in free flights! With how easy this is, anyone else going to try this? 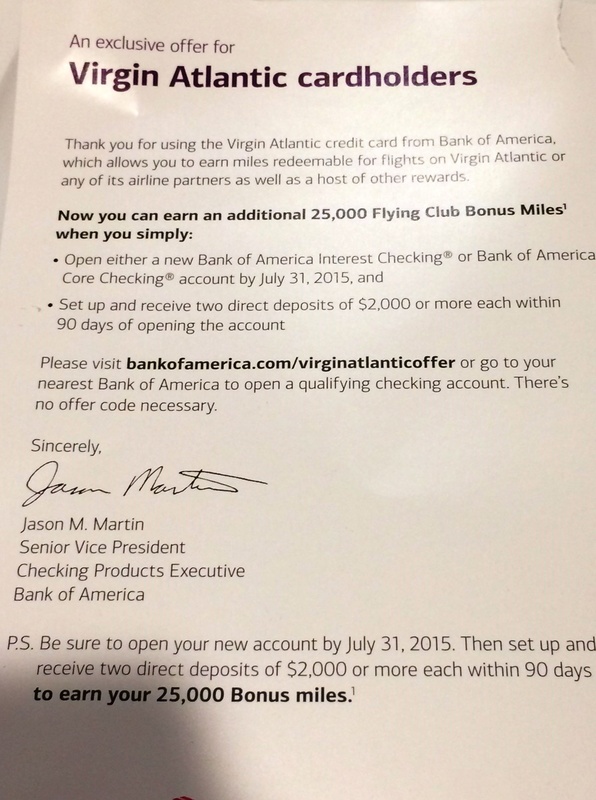 Similar to the current Alaska Airlines checking account offer, Bank of America is now offering 25,000 Virgin Atlantic miles for signing up for a checking account and having two direct deposits of $2,000 or more hit your account within 90 days. This offer is exclusive to Virgin Atlantic credit cardholders. If you have an open Virgin Atlantic credit card, you should be eligible for this offer, even though the terms indicate you must receive this communication (this is similar to the language on the BofA Alaska checking account offer). See a snapshot of the mailer below I received in the mail though it can also be found online. 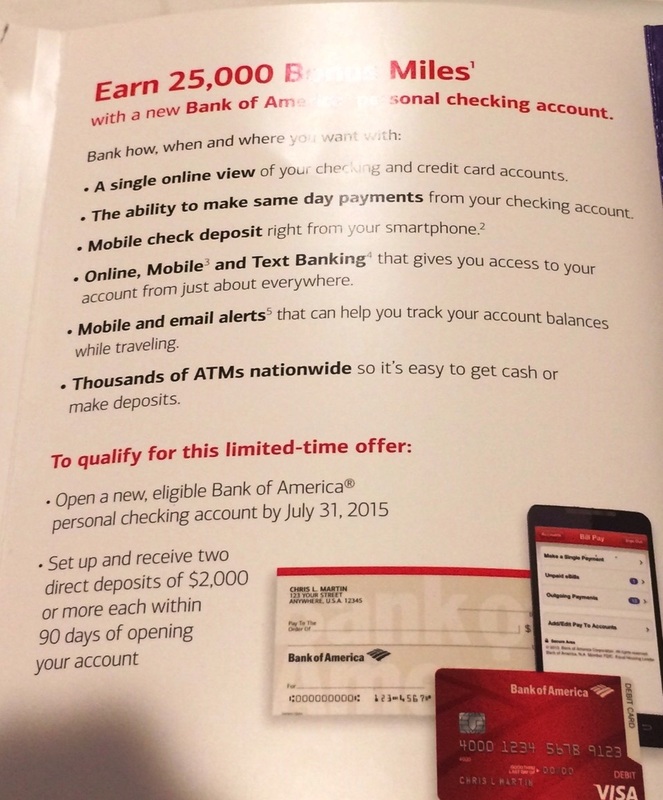 Bank of America currently has an identical offer for 25,000 Alaska miles which I find far suprerior. Alaska miles are worth a lot more, easier to use and you don’t have to worry about fuel surcharges. That all said, if you don’t have an Alaska credit card (which makes you eligible for that offer) but have a Virgin Atlantic credit card, this is an easy 25,000 miles for little work. You can have the monthly service fee of $12 waived for the Core account by maintaining a balance of $1,500 so fees aren’t an issue. For the direct deposits, you don’t need to have a paycheck of over $2,000 – Doctor of Credit maintains a great list of other ways to satisfy direct deposit requirements. I’ll be passing on this offer as I’m taking advantage of the 25,000 Alaska Airlines checking account offer but if I wasn’t eligible/targeted for that offer, I’d consider grabbing this one. Programming Note: These PSA posts will become a weekly post effective immediately as I have lots of little tidbits that I think are worth reminding others about so they don’t do something dumb. My past PSA posts have been pretty popular so I’ll see how the response is to a weekly post. I’ve said this before and I’ll say it again – it really annoys me when big, prominent bloggers push inferior offers to their readers and do not share the best offer on a particular product because it doesn’t offer them a commission. 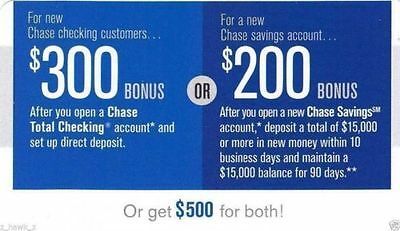 The latest and greatest example of this is The Points Guy posting (after discussing with others I took away my link to his post but I’m sure you can find it) about earning a $250 bonus for opening a Chase checking ($150) and savings account ($100). I’m sure at face to the uneducated reader that seems like a great offer but you can do much better – in fact I can show you how to get a bonus of $300 on just the checking account alone. So what’s the trick to getting these better offers? 1. Know the landscape of all current offers – Similar to credit cards, you want to get an idea of if a particular bonus is high or low relative to the historical bonus offered on that product. I think the best resource to follow bank bonuses is Doctor of Credit who covers bank bonuses pretty in-depth including both nationwide banks and smaller state specific banks. In this case, I see a wide range of offers topping out at $600! for both a checking and savings account at Chase. Yes, the deposit requirements might be different but its worth checking them all until you find one that works for you. Chase Checking ($300) and Chase Savings ($200) – This requires direct deposit (checking account) and deposit of $15,000 (savings account). The checking account bonus alone is higher than The Points Guy offer even if you choose not to do the savings account offer! Chase Checking ($200) and Chase Savings ($100) – This requires direct deposit (checking) and deposit of $10,000 (savings). Same as requirements as The Points Guy offer but $50 better to you! Chase Checking ($200) and Chase Savings ($50) – This requires direct deposit (checking) and deposit of $5,000 (savings). Same bonus from The Points Guy offer but deposit requirement are not as high. 3. Google can also be your friend – A quick Google search for “Chase checking account bonuses” returned many hits (obviously) but one of the top ones was a link to Hustler Money Blog who is giving away $300 checking account bonus & a $200 savings account bonus to all his readers with no cost involved. There were also other sites either giving them away or giving readers instructions on how to get a higher bonus. I think the 5 minutes of Googling to pocket a possible extra $50-$350 dollars is worth it. 4. If all else fails, wait – Let’s say you checked all the resources above and either didn’t find an offer you were comfortable with or didn’t want to pay a trivial amount of money for a code off eBay. That’s fine so I would recommend to sit back and wait for a targeted offer (if you have a Chase credit card you will eventually get an offer at some point) or for the public offer to increase. Again, this is just like credit cards. If the bonus on the Chase Sapphire Preferred was cut to 20,000 points tomorrow, you would wait to apply until the bonus was 40,000 points again right? Take the same approach here with bank accounts. The Points Guy is obviously too busy playing with his Apple Watch (seriously how many posts has he had on it?!?) as this is yet another example of his inability to post about the best offers on a particular product. Would you want to do business with a financial advisor who pushes substandard investments because it paid him a fancy commission? Of course not. But that’s why I have these PSA posts to help others avoid this mistake. Sure, my readership is about 1/10000 of The Points Guy but if I helped one person get a few hundred more dollars in their pocket, then this PSA post has done its job.